Creatures of the deep are a special interest of Randy Groves, and his ability to create marine animals seemingly alive in an aquatic environment makes these sculptures favorite choices amongst his admirers. 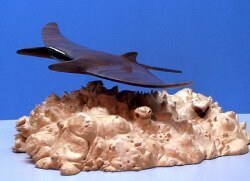 While Randy Groves' manta ray sculpture is no longer available in bronze, it still may be obtained in pecan wood. 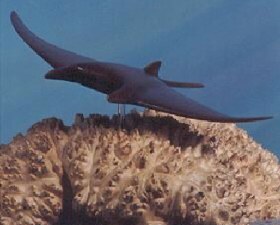 The original woodcarving from which the bronze manta ray was cast.